For another Lugano route, see Lugano to Paradiso Route. 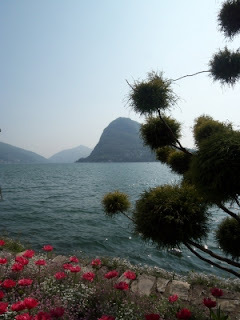 When I heard that I had to go back to Lugano for a business trip, I was really looking forward to it. 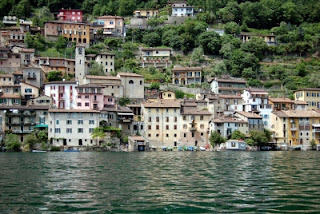 I hadn't been there in almost 20 years, but my memories were nothing but pleasant: a beautiful old town perched on the north edge of an alpine lake (Lago di Lugano), with steep mountains rising all around, balmy evenings on the waterfront, watching teenagers in the lanterned little pedalo boats bobbing around out on the lake while the boat-rental guy worriedly paced around and occasionally yelled out over the water, hoping that they would bring the boats back before closing time. And long evening runs along the lake and up in the hillside neighborhoods of nearby Monte Bré. This time I was there in January, not summer, with short days and freezing nights, so it wasn't quite the same. But the town hasn't changed much: elegant old streets oozing old-world charm, arcaded storefronts full of expensive Swiss watches, jewelry and chocolates. Grand hotels and grand cafés, the waterfront casino, the little cable-car to take people up the hill to the train station: who can escape such quiet charm? This time, the mountains seemed even steeper than I remembered. While running, I had to watch my step in the dark, and try not to slip on the ice, but I enjoyed it anyway. Lugano is pressed in along the lake by hills and mountains, so a run along the lake promenade is the logical choice. But there is a fairly loud street running along almost the whole waterfront, so it isn't as ideal as it looks. Only the beautiful, if smallish, Parco Municipio in the town center offers a quiet retreat from traffic noise. So, if you only have a short time to run anyway, you should just plan to jog a few laps around this green waterside oasis. The park has everything a nice little town park should have: statues and fountains, giant sycamores, pines and sable palms, a winding lakeside shoreline with gorgeous views of mountains and water, an elegant old boathouse, pedalo boats, an adventure playground for the kids, the cantonal library and school. This is the kind of place I would prefer to be buried and spend an eternity. 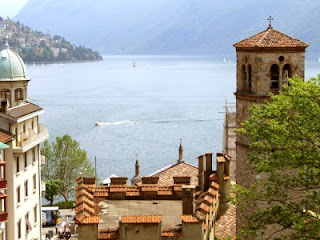 But there is another route that heads east out of town, which, after a couple of kilometers, provides a beautiful, quiet, natural trail along the lakefront, and ends in a picturesque village: Gandria. Gandria was once reachable only by boat. 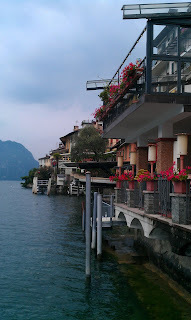 Even today the town alleys are car-free, as the modern lake road runs up above the village itself. The footpath that we will follow was first carved out of the lakeside rocks in the 1930s, and is now a perfect spot for hikers and runners. Other tourists show up by the regular tour boats or drive there, parking above, along the road. NOTE: another alternative run would be to run on Monte Bré. There are some neighborhoods along the mountainside with quiet streets, reached via the lake road. And like all Swiss mountains, it has a little red cable-railway (funicular) that goes to the top. You could do a run on top of the world up there around Bré village, and even run down, if you felt like it. 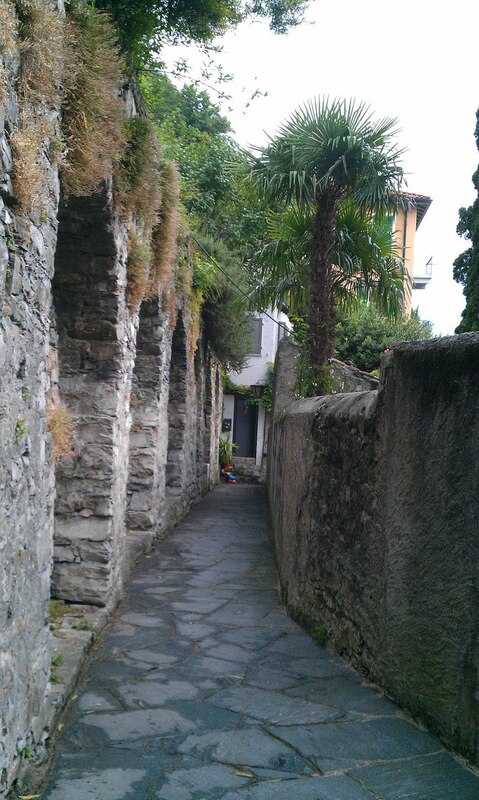 One path leads down to Gandria. The funicular train goes every half-hour and costs 20 francs, round-trip, or 14 francs one-way. The run follows the lakefront road for a few kilometers, then cuts off into a waterfront path, as the road serpentines its way up the hillside. 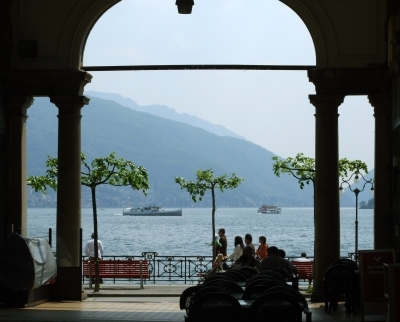 We'll start right in the heart of town, at the Piazza della Riforma in front of the town hall, right at the lakefront. 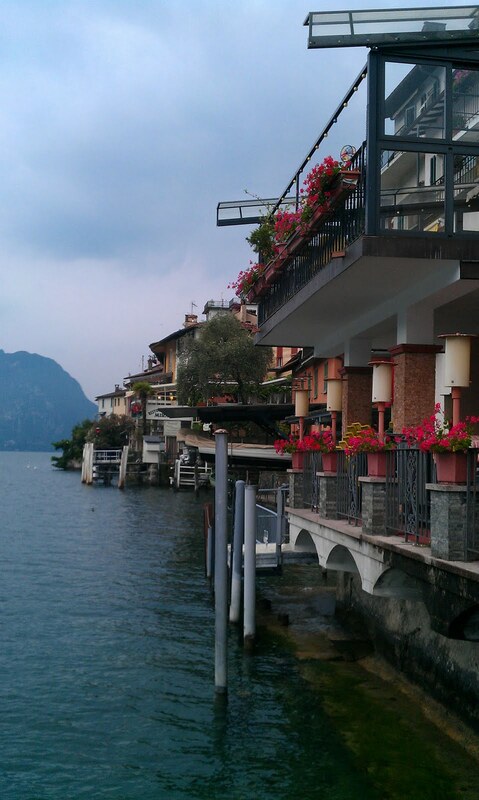 Run across the plaza to the lakefront street, Riva Albertolli. There is no pedestrian crossing here, so take the pedestrian tunnel right there at the curb, coming up at the water side at the biggest pedalo rentals.These pedal-driven boats were made in the form of 1950s cars, and I've never seen similar ones anywhere. Turn left and run eastwards, with the water to your right side. In just a few blocks, the road curves to the left around the casino, but keep running straight into the Parco Municipio. Stay along the water's edge, as the path curves to the right. The park ends in a point going out to the lake, abruptly halted by the Cassarate River, which flows along the east side of the park. Take the path along the river, running away from the lake. You will pass a pedestrian bridge, going over to the Lido beach on the other side, but you can't run through the Lido along the water: you have to keep going inland to run around it, turning right on the first street, Viale Castagnola. You are now running straight towards the massive wall of Monte Bré. This is the shore road again, with quite a bit of traffic, and it soon passes the Lido and the tour-boat operations. When you get to the ugly Migros supermarket (OK, what supermarkets aren't ugly? ), you can turn right to run through a bit of shoreside park again, with a little marina, and get away from the cars for a minute. NOTE: When you then pass the Castagnola Hotel on the left side, where the road curves to the right, you'll see Via Pico leading off to the left. The funicular railroad to Monte Bré is just 200 meters down the street, if you want to head up the mountain. There is also a stairway just before the station, if you want to go up by foot. 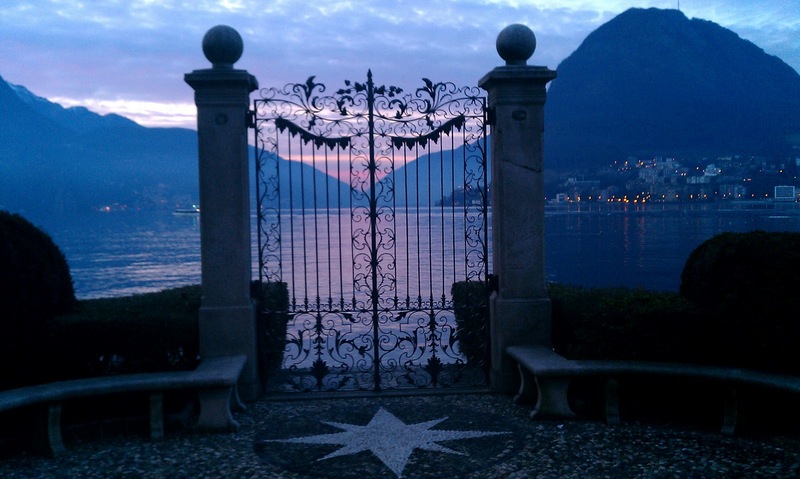 You will now find yourself leaving Lugano. The houses end, and the road starts following the base of Monte Bré, going gradually uphill, with just an asphalt walkway next to the street. You might be wondering what kind of a stupid route this is, as a steady stream of cars buzz by you. But relief is on the way: after just half a kilometer, just before the road begins to serpentine its way up the mountain, a small street branches off to the right, Via Cortivo. Follow this street, which goes by some villas in the town of Castagnola, as it guides you back towards the lakeside. After half a kilometer, the street ends in a little parking lot, and the real footpath to Gandria begins. From now on, it's straight through a quiet landscape of olive groves, a grotto, beaches and anchorages on the Sentiero di Gandria. The route is promoted as the "Olive Path", and there has been an initiative underway to restore the old, abandoned olive groves that once were plentiful in the area. 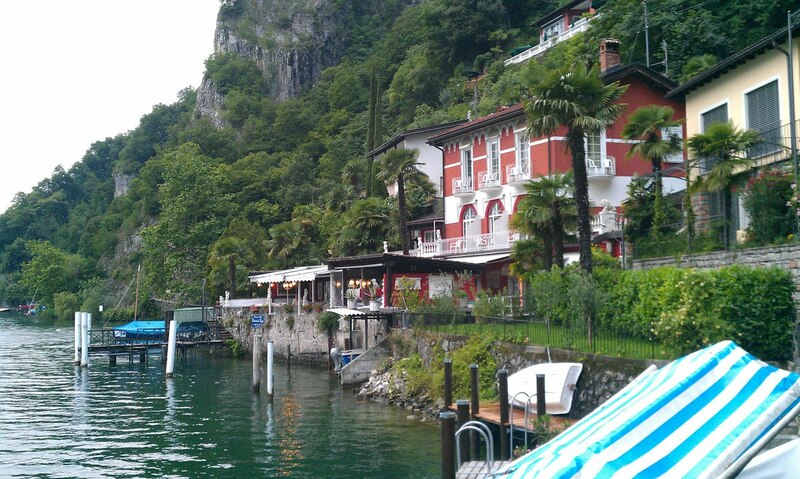 Enjoy the beautiful waterfront views of the Italian mountains on the other side of the lake. When you reach the village, in just another kilometer, you'll definitely want to follow the twisted alleyways and stairs of this charming lakeside oasis. A nice beer or glass of wine is definitely in order to reward yourself for the run out of town. The way back is the same way as you came, unless you want to take a tourboat for a change of propulsion, cutting the total running distance to 5.3 km.